The repairs and alterations now going forth on the dam present an excellent opportunity for the placing of fishways therein, and a number of our sportsmen are interesting themselves in the matter and will ask the water-power owners to make the improvement. The fish and game warden has been written to and has promised to forward the necessary pIans for the scheme shortly. Those who have seen these fishways in operation say it is surprising how many fish will ascend them in the spring of the year, when the course of the fish is always toward the head waters. There is no doubt that with a couple good fish ways in the dam the fishing above the dam would be greatly improved and it is hoped by all interested the improvements will be made. The contracts for the building of the concrete dam below Main Street bridge have been let to Frank E. Cowan, of this city, the consideration being about $5000. It will be 190 feet long, 12 feet wide at the bottom and 3 feet wide at the top and 10 feet high. The north side of the dam will be almost perpendicular, slanting, only slightly at the top. The south side of the dam will have considerable of a slope to it, and that will do away with the falling of water as with the old dam and prevent the air concussion which for years past have been caused by-the falling of the water over the dam, causing doors and windows to rattle in every section of the city. 10 28 Yesterday forenoon a farmer, whose home is about a mile north of Richwood, came to the city to transact business and during the day became intoxicated to such an extent that he was placed in the city lock-up until he become sober. Toward evening he was released, and it is supposed that he at once proceeded to fill up again and in the night hitched up his single horse which was attached to a light wagon upon which he had some lumber, stove and family supplies, and in his muddled condition instead of starting for home drove off the embankment at the west end of Market street into the river. The horse which was a young and valuable animal was drowned, and both the horse and the wagon floated down to the dam where they could be seen this morning. As the unfortunate man has not been seen since the accident, it is thought that he is also in the river and efforts are being made to recover the body. 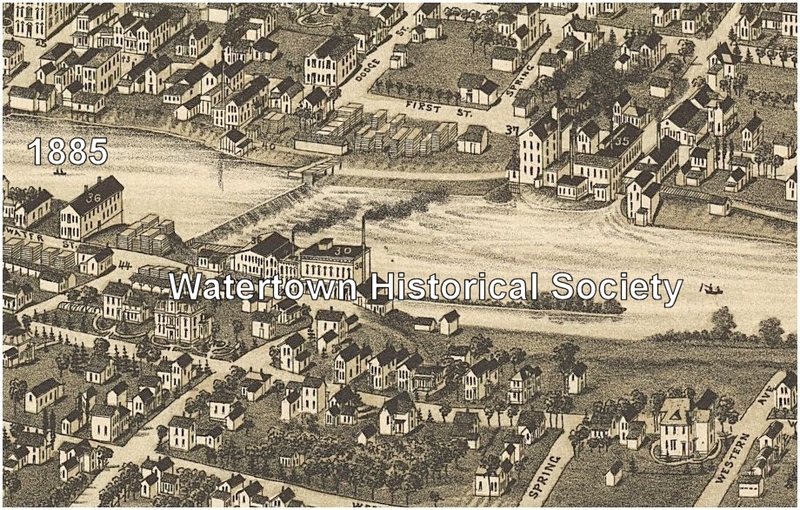 There are two dams located in the City of Watertown; the lower, a masonry dam, located a few blocks above the Chicago, Milwaukee and St. Paul Railroad bridge, and the upper dam, one and one-half miles above this. The bed of the river at both dams and probably the entire distance between, is in the Trenton limestone. 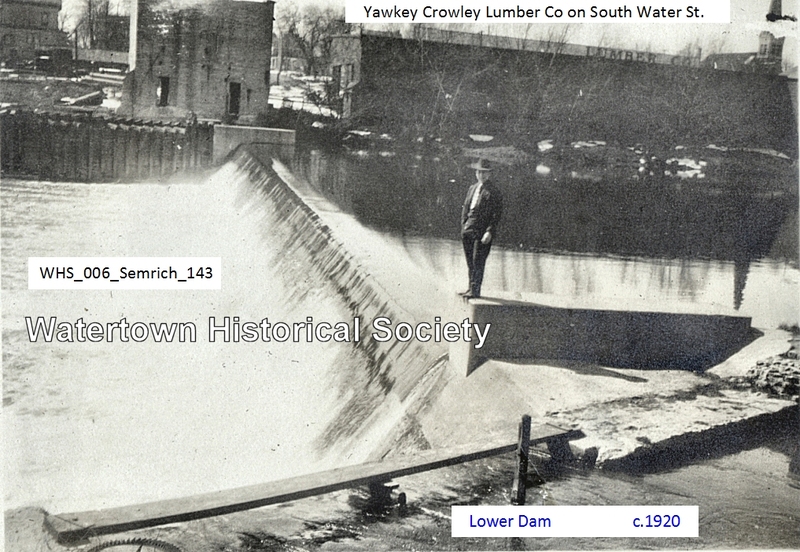 The upper day, usually called the “Rough and Ready” dam, is built of timber with masonry abutments. It is 250 feet long and develops a head of 9 feet. One 45 and one 55 inch turbine are installed, rated at 225 horse-power. This power is owned by the Watertown Electric Company and is used for electric light and power. As the left bank is low the present head represents the maximum head which can be developed. Indeed there have been some complaints of illegal flooding at times of high water. The dam is in a fair state of repair. The legislature of 1906-07 granted the owners the right to raise the crest of dam 2 feet, provided all payment should be first made for all damage so caused. The lower dam was reconstructed three or four years ago, the present concrete dam replacing an old style timber structure. The present dam is 250 feet long and furnishes a head of about 10 feet. This head cannot be increased as the dam backs the water to the dam above. The lower dam furnishes power to four different concerns, two on each bank. 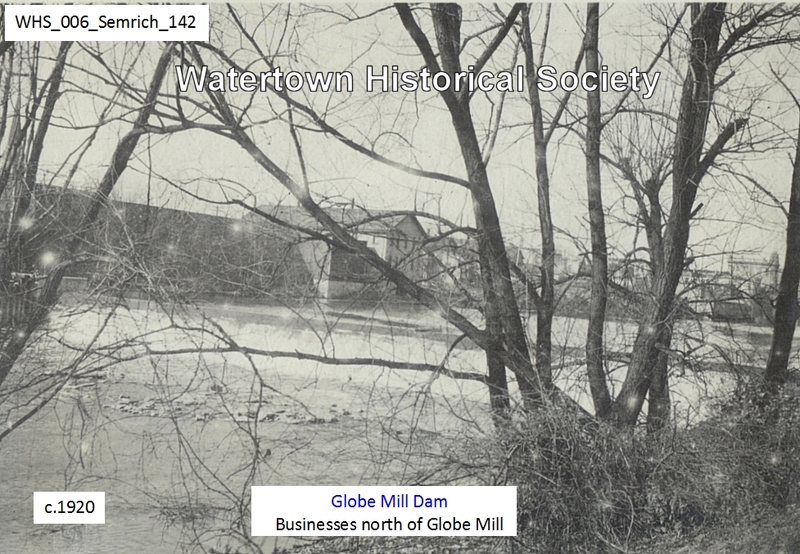 On the right bank are located the Bee-hive and Box Factory owned by G. B. Lewis Company and the Globe Milling Company with installations of two 30 inch and two 40 inch turbines respectively. On the left bank are located the R. P. Koening Company flour mill and the A. R. Wein Brush Company factory with an installation of 60 inch and 30 inch turbines respectively. The mills run 18 and the factories 10 hours per day. The owners report that for 8 or 9 months in the year the turbines develop their full power but that during the remainder of the year steam power has to be to a large extent substituted. For this purpose the above flour mills have the following steam power: The Globe Milling Company 200 horse-power; R. P. Koenig Company 85 horse-power; G. B. Lewis Company 225 horse-power, and the A. R. Wein Company 25 horse-power. The head on the turbines is reported to vary between 12 and 6 feet. With water to the crest of the dam the head is 10 feet. Complaints of illegal flooding by this dam have been made side the reconstruction of the dam. Watertown is a growing city of 9,000 inhabitants. It is a trading center for a large and rich agricultural region. The city is on the main line of the Chicago, Milwaukee and St. Paul Railroad between Milwaukee and St. Paul and also on the Madison branch of the same railroad. The city is also served by the Chicago and North-Western Railroad between Beloit and Green Bay. Between Watertown and Lake Koshkonong, a distance of 29 miles, the river flows almost due south and with reduced windings. The river varies in width from 150 to 250 feet wide, with banks sloping gently back to a height of from 10 to 20 feet. Old G.B. Lewis Plant, barber shop on Main St bridge in the distance ["The Bridge" barber shop, John Seager]. Shop taken out by March 26, 1904 flood. 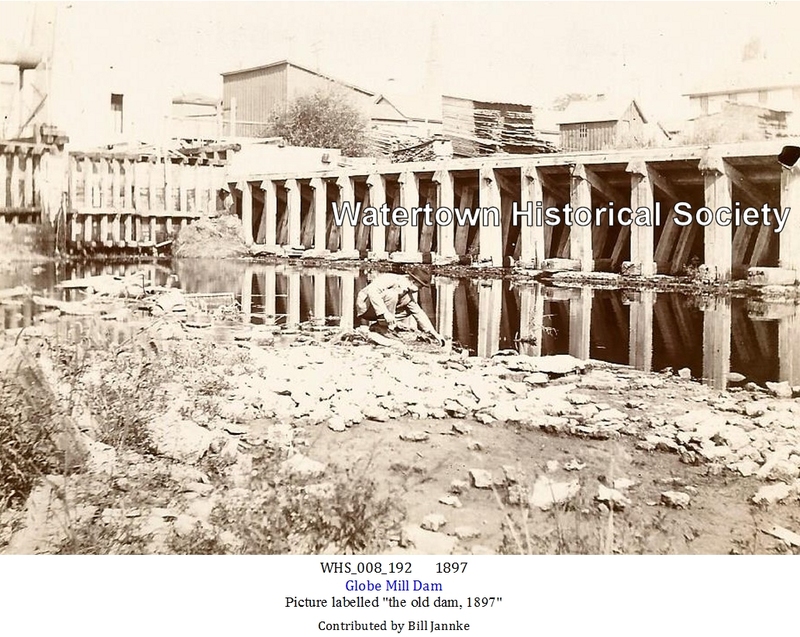 Watertown will receive a $200,000 grant next year to repair the lower dam. Earlier this year the city was told it had just missed funding for the project. The city’s project ranked 13th and only 12 were funded by the Wisconsin Department of Natural Resources. 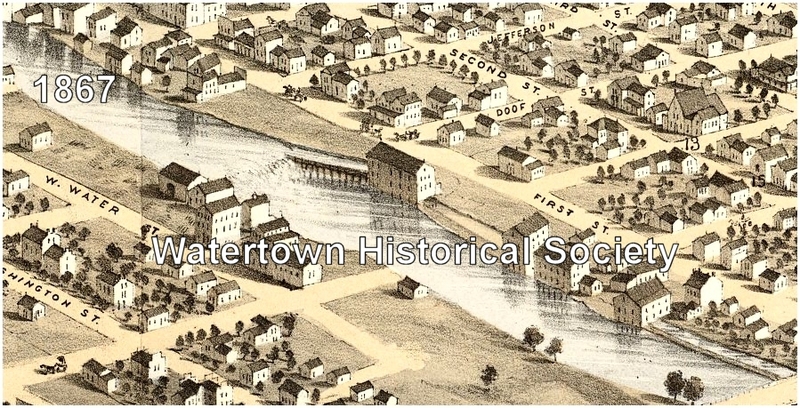 However, because one community later declined the grant, Watertown was offered the funds. Joseph Radocay said the grant is good news for the city. The council this year authorized borrowing the full $495,000 for the project. Under terms of the DNR grant, the city will have to prepare plans and specifications for the project in the next four months, have them approved and have the actual construction project completed in 1992. For the first time in decades, power will be generated at the lower dam of the Rock River starting next spring. Tom Reiss, owner of Rock River Power and Light Company, said he hopes to generate hydroelectric power at the dam starting in April 1993. The dam, located south of Main Street between Water and First streets, was last used to generate mechanical power about 40 years ago. Currently, workers from Zenith Tech. 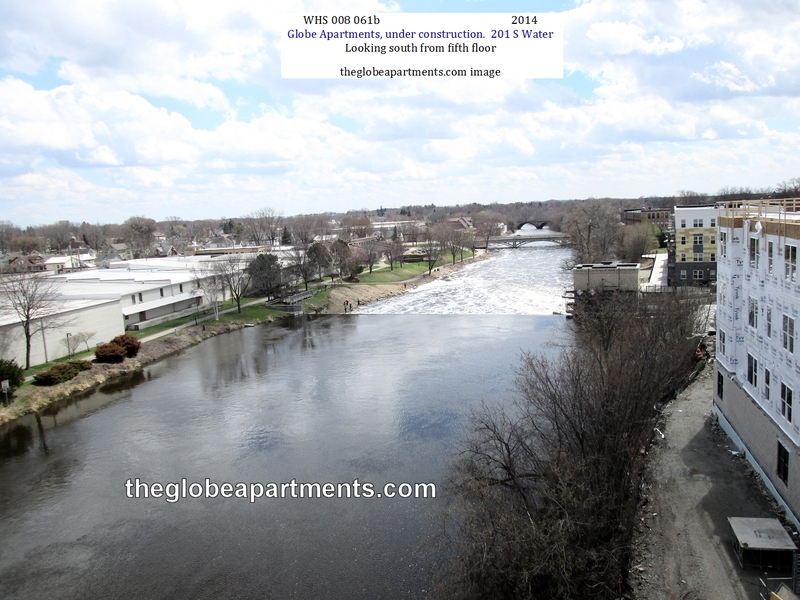 Inc. of Waukesha are constructing the powerhouse building, located on the west banks of the river. The concrete base of the building has been poured for the four-floor structure, which will house two turbines capable of generating a maximum of 350 kilowatts. Once work is completed on the building and a new tainter gate is installed, the coffer dam will be removed on the west side. The coffer dam has directed water away from the section of the river where work is being completed. The council voted to choose the low bidder, Janke General Contractors to do the dam’s rehabilitation work for $1,048,989. The dam was last repaired in 1992, but a mesh fabric that was placed on the upstream side of the dam improperly adhered to concrete on the dam. Over the years it has further eroded, allowing water to get behind the dam and with freeze thaw conditions and the way the dam is constructed with the concrete created seams where water was able to go through creating pop-outs on the front base of the dam. Part of the project will be funded through a DNR grant that would pay for about $362,000 of the total cost. Because of budget restrictions, a separate repair of the dam’s tainter gate will have to be postponed until more funds are available. As part of the project, the observation deck overlooking the deck will have to be removed for crane placement. The project was originally scheduled to begin a year ago, but all bids came in over the budgeted amount. Although there is no definitive start date yet the project must be completed before Dec. 29 to receive the grant funding. Council Proceedings: Review & approve Construction Inspection & Project Management Contract from Ayres Associates for Lower Dam Repairs Project. Engineering is recommending Ayres Associates at a cost for inspection services of $30,300.00 during construction and $2,100.00 for post-construction. Motion passed unanimously. Finance Committee was made aware of an upcoming change order to the lower dam project. After closer sounding of the dam’s downstream face, it was discovered more square footage will have to be repaired. The order is expected to cost an additional $26,000 which will come out of the reserve fund created for the project. Janke General Contractors will be working to install an impermeable geomembrane on the upstream face of the existing concrete gravity spillway, perform surface repairs on the upstream and downstream faces of the concrete spillway, and inject cementitious grouting at the left abutment at the dam's left abutment. The dam was last repaired in 1992, but a mesh fabric that was placed on the upstream side of the dam improperly adhered to concrete on the dam. Over the years it eroded, allowing water to get behind the dam with freeze and thaw conditions. The way the dam is constructed with concrete created seams where water was able to go through, creating pop-outs on the front base of the dam. Part of the project will be funded through a Department of Natural Resources grant that would pay for about $362,000 of the total cost. Because of budget restrictions, a separate repair of the dam's tainter gate will have to be postponed until more funds are available. Change Orders No. 1, 2 & 3 for the Lower Dam Rehabilitation Project were presented. Change Order No. 1 is a deduction from the contract of $15,000.00. Change Order No. 2 is an addition of $28,380.00 for the purpose of purchasing boulders. Change Order No. 3 is an increase in the contract of $55,241.50 to mobilize, demobilize and place this rock as required for the project. The motion to adopt these resolutions carried. Despite a few last minute change orders, the rehabilitation of Watertown’s lower dam was completed ahead of schedule and under budget. One of the change orders involved the replacement of hundreds of angular boulders which dissipate energy and noise from water crashing over the dam. The old boulders were discovered to be damaged by erosion when the river level was lowered earlier this year. The city purchased 645 tons of rock which weigh between 1,500 and 4,000 pounds each. The boulders, which cost just over $28,000, were purchased from Michels Materials, a quarry in Waterloo, and are made of a quartzite material, which is harder than limestone or even granite so they’ll be less prone to erosion. Even accounting for the change orders, the cost of the project, which totals just over $1 million, came in about $100,000 under budget.